Map of Monuments and Memorials in Washington, D.C.
Washington, D.C., is filled with so many amazing National Monuments and Memorials that you could easily spend a couple days exploring them all. Get started plotting your route with this map of monuments and memorials that will help you navigate your way to the popular spots. The best way to see the memorials is on foot. Among the most popular are the Washington Monument, the Lincoln Memorial, the Jefferson Memorial, the Vietnam Memorial, and the World War II Memorial. You can also take a guided tour to learn in-depth facts about these sites as well as some American history. Tours range from hop-on-off trolleys to bike tours. If you want to see the memorials in a whole new light, be sure to sign up for a moonlight tour. See a guide to the best sightseeing tours in Washington. D.C.
For detailed information about each of the memorials, public transportation, and sightseeing tours, see Monuments and Memorials in Washington, D.C. This map shows the monuments and memorials in pink. Most National Memorials are located on the National Mall and the Tidal Basin in Washington, D.C., east of the Potomac River. Northern Virginia is west of the river and is home to Arlington National Cemetery, the Pentagon Memorial, the Air Force Memorial, and the Marine Corps Memorial. The Metro stations are noted with an "M" icon and parking garages are noted with a "P" icon. The National Mall area is the busiest part of the nation's capital. The easiest way to get around is to use public transportation. The best starting point for a walking tour of the memorials is the Smithsonian Metro Station. From there, head to the Washington Monument and then proceed to the attractions of most interest to you. Public parking is limited near the National Mall. On-street parking in Washington, D.C., is restricted during morning and evening rush hours. Most of the free on-street parking is restricted to two hours. Read more about parking near the National Mall. 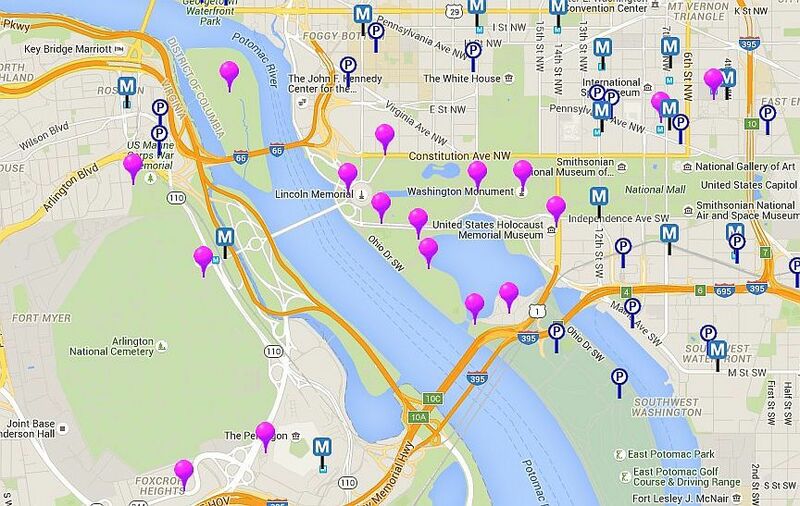 This map shows the monuments and memorials located in Washington D.C., proper. Plan to spend a lot of time at the National Mall and the Tidal Basin. Enjoy a nice walk around the heart of the nation's capital and take in magnificent views of America's iconic landmarks. If you are visiting during spring, you will get to see all the beautiful cherry blossoms in bloom. Northern Virginia is west of the Potomac River and home to Arlington National Cemetery, the Pentagon Memorial, the Air Force Memorial, and the Marine Corps Memorial. To visit these attractions, take the Metro to the Arlington National Cemetery stop, Rosslyn Station, or Pentagon Station. You can easily spend a day exploring these attractions in Northern Virginia. To learn more about the area and to plan your visit, see the top 15 Northern Virginia attractions.